You are here: Home // Deals/Price Cut // Huawei P9 now available for Rs. 29,999, Flipkart offering 25% discount over launch price. Huawei P9, the 2016 flagship from Huawei which was launched in India in August 2016 as Flipkart.com exclusive is now available for Rs. 29,000 a flat discount of 25% on the launch price of Rs. 39,999. Interestingly, Samsung too is offering up to Rs. 10,000 cash back on its 2016 flagship device, the Samsung Galaxy S7 Edge. 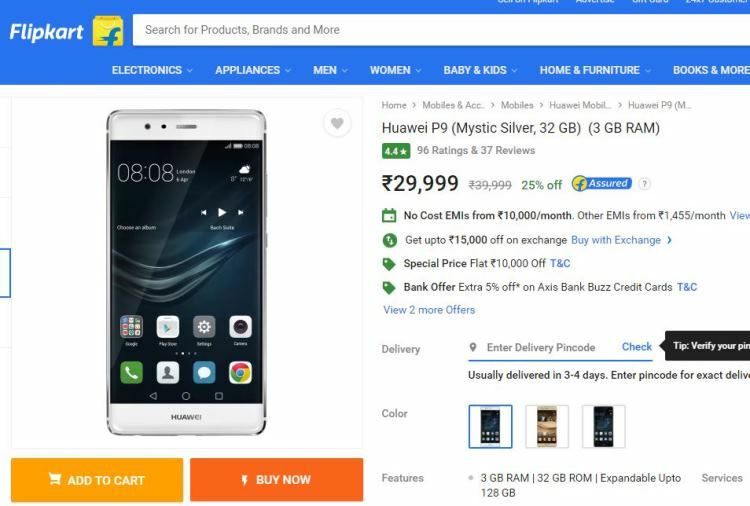 Coming back to Huawei P9, anyone interested to buy Huawei P9 can head over to Flipkart.com and avail the discounted price. Also there is an option of No Cost EMI but that is available for Rs. 10000 per month only. Just to remind you, the highlight of the Huawei P9 is the dual camera at the rear which has been developed by Huawei & Leica jointly. Huawei P9 sports a Unibody design, a 5.2 inch Full HD 1080p IPS display with 2.5D curved screen. Powered by Huawei’s Kirin 955 64 bit 8 cores processor, it has 3GB RAM, 32GB internal storage and a microSD slot supporting up to 128 GB. For the phtography enthusiats, Huawei P9 comes with a 8 megapizels front facing selfie camera and a 12MP + 12MP dual camera setup at the back developed by Huawei & Leica jointly, also it has Dual Tone LED flash. Connectivity featurs include 4G LTE, Dual SIM Card slot, WiFi 802.11 a/b/g/n/ac, Bluetooth 4.2, USB type C and GPS. At last the Huawei P9 comes with a 3,000mAh battery along with fast charging.